For E46 M3/E39 M5 only. 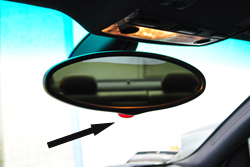 The Red transparent cover that sits on the bottom of the E46 M3/E39 M5 Mirror is often referred to as the 'Clowns Nose'. It is the cover for the Alarm LED that sits in the bottom of the mirror. The LED flashes when you set the alarm in your car and acts as a deterrent to thieves that is highly visible from the outside. Unfortunately they are only clipped in to the mirror and are often knocked off the and lost forever! This leaves an unsightly hole exposing the circuit board and leaves the alarm LED protruding out the bottom of the mirror. This doesn't look pleasing to the eye and means the alarm LED can easily be knocked/caught and broken off the circuit board. BMW do not sell this alarm cover separately, only a complete new mirror at a cost of over £400! As the cover's shape is unique to the E46 M3/E39 M5, you cannot use a cover off a different model of BMW as the curvature is different to fit the Oval mirror. Many of my customers have been asking me to buy these covers and cannot buy them anywhere in the world. I have prototyped and manufactured a replacement transparent cover that fits perfectly in the bottom of the mirror. 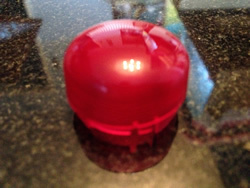 It is made out of a transparent red plastic like the original, so your alarm LED will flash it's normal red colour. Lose the unsightly hole in the bottom of your mirror and return the interior of your car back to looking like it should! These covers are manufactured individually, which is time consuming and expensive, but still a fraction of the cost of buying a new or second hand mirror. These are machined on a CNC lathe out of a special plastic bar. 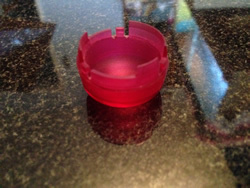 I went through various types of plastic and different tooling until we found a solution that did not crack/splinter the material. They are a really complex shape with different cut-outs and it took ages to setup the software to duplicate this complex shape. They have to be cut one at a time and then hand polished. This is very time consuming and fiddly. They have a slightly different finish to the originals. We were considering shot-blasting them with fine glass to try and replicate the 'rough' finish of the originals but this would have added more cost and we don't really feel it is needed. Therefore they are smooth and slightly more transparent than the originals and slightly more 'Red' because of the material used. They emit slightly more light from the Alarm LED so are a little more visible at night. They incorporate the 'locating pin' like the originals and are a perfect fit. 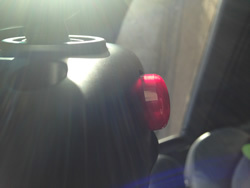 In fact, they are an improvement over the original as they fit tighter with a satisfying 'click'. Therefore they should be much harder to dis-lodge and lose. Thank you for your order. Your item(s) will be shipped straight away. Please check your email for your PayPal receipt.